Scary stuff! But reading these articles, I found myself wondering, is it actually true? Like so many myths, there is a kernel of truth. But the interpretation that volatility is an active force, “pulling” down returns and costing you money, is simply not correct. In Part 1, we will explore the crux of the issue, understanding the geometric mean. In Part 2, we will apply this understanding to arguments for volatility drag. Remember free-body diagrams from physics class, the drawings of an object with arrows representing the forces? Drag was a common force, present when an object moved through a medium like air or water. So where does the “volatility drag” force come from? What medium is it that prices move through? 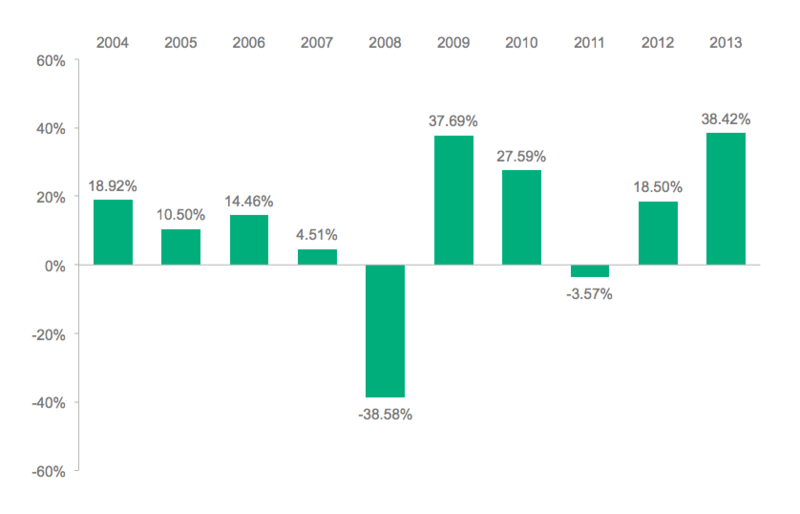 If you have read a mutual fund prospectus, then you have seen a chart similar to the following one, showing the annual total returns for the previous 10 years. The percent returns are the year-over-year numbers and are straightforward. 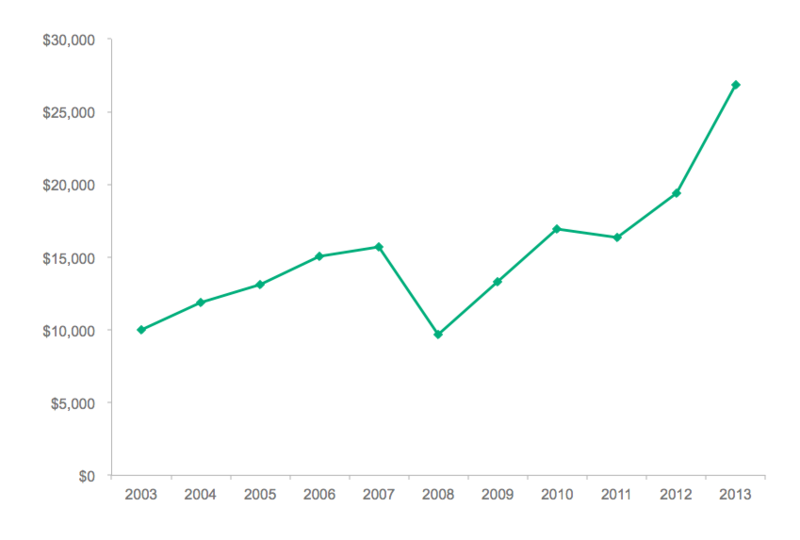 These charts are accompanied by a table that includes average annual total returns for one, five, and 10 years. Here we must be a little cautious: This use of average is not the most common usage. In most cases, when we see the term average, we add up the numbers and divide the total by the number of elements. 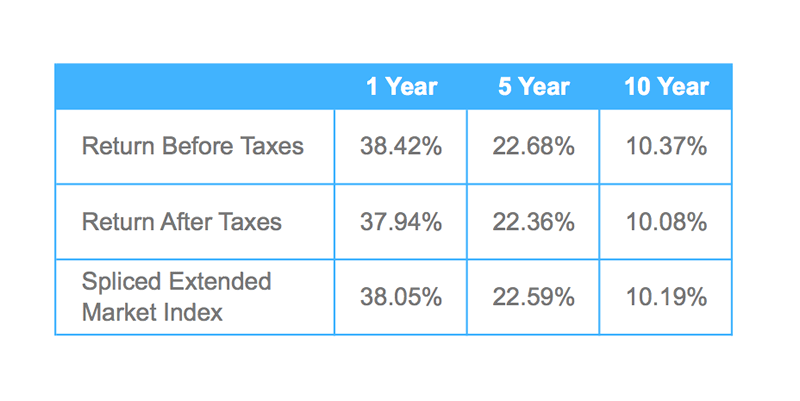 A quick check with the five-year return before taxes, calculating the usual average, is 23.75%. But the table says 22.68%. That is because there is more than one type of average, or mean, and in this case the geometric mean is the appropriate one to use. So why is it “appropriate”? The arithmetic mean is the one with which we are most familiar. It is a property of sums: 2 + 8 is a sum of two elements. The one value that relates the number of elements to the sum of the elements is the arithmetic mean. The geometric mean is the analogous property for products. 2 * 8 is a product of the same two elements. The value that relates the number of elements to the product of the elements is the geometric mean. 2 * 8 = 16: Is there one number that when multiplied by itself equal 16? Yes, and we can find it with the square root. √16 = 4. This is the geometric mean. What if we had three elements? Say 2 + 8 + 32= 42. The arithmetic mean is 42/3 = 14. Another chart you may see on a prospectus or fact sheet is the growth of a hypothetical investment using the annual returns. Can we calculate the final value using only the returns? 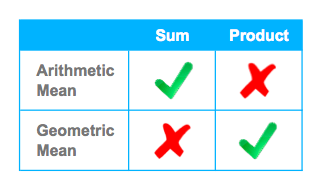 As we discussed in the section above, the geometric mean is the average to use on a product. So, the geometric mean of the returns xi over 10 years is or a 10.37% annualized return, which matches what we were given in the table! With this value, we can calculate the ending value directly: $10,000 * 1.1037^10 = $26,828. 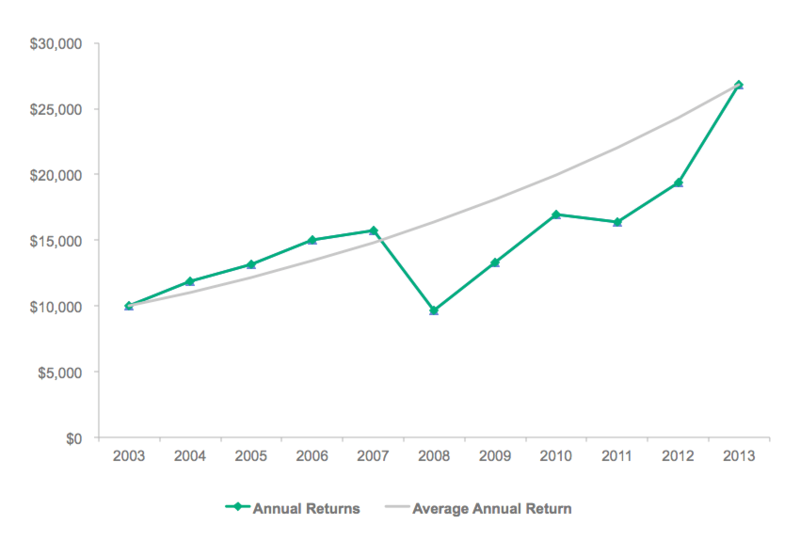 The average annual return also lets us calculate the value for the intermediate years, as if there was an investment that earned exactly the average annual return every year. This is plotted below, showing a smooth curve that starts and ends at the same points. What about Log Returns, Are They Related? Noting that 10.37% is the same value we determined above, we can see the two approaches are equivalent. Now when statements are made regarding the average return, we can ask a few questions. What kind of average? If it’s from a series of chained returns (i.e., a product), are they talking about arithmetic mean of log returns? Are they talking about the geometric mean of the returns? If neither of these is the case, we must examine the conclusions more closely. “Volatility drag” is one such conclusion. We found that the arithmetic and geometric means are related — both are equations using the same set of numbers — but the difference between them is in the definition, not from a force. Why, then, is this such a persistent myth? There are two seductive arguments made in its favor. One is very simple and appeals to our intuition, but contains a flawed assumption. The other stems from a slight misinterpretation of terms in a widely used mathematical model of prices. Using the language of arithmetic and geometric means developed here, we will look at these two arguments in the next post and consider some of the practical ramifications. Will Morrison is manager, business analytics and reporting, at CFA Institute. Previously, he was an engineer at GE, specializing in robotic path planning. Morrison has earned the Claritas Investment Certificate. He holds a BA in computer science from Goucher College, a BS in electrical engineering from the Johns Hopkins University, and a masters of systems engineering from the University of Virginia. I agree that this is a bit of a myth… I wrote this mathematical post on the subject. Perhaps you’ll find this usefull. The Limitations of Diversification Return, The Journal of Portfolio Management Summer 2014, Vol. 40, No. 4: pp. 65-76. Volatility drag is defined as the difference between arithmetic returns and geometric returns. It is appropriate to call it “volatility drag” because it is higher when volatility is higher. It is not a myth. It is real. It is always positive or zero. Bigfoot is a myth. Sigma squared isn’t. In the context of leveraged ETFs volatility drag WILL cost you returns. That cost is no myth. The drag increases with volatility. If you leverage too much the volatility drag will bring returns down to zero? The difference between zero and positive returns is no myth. I think it is fair to say that this topic is only discussed because our industry continues to use arithmetic returns in some of its models, simulations and projections. If we only spoke about returns appropriate for multi-periods calculations – ie geometric returns – then we would not have to reconcile between the two. A related topic is the interaction between the returns generated by a portfolio and the cash inflows and outflows experienced by the portfolio. Professor Michael Drew and others have written extensively about this topic in the context of retirement incomes (e.g. Sequencing risk). More volatile portfolio returns can increase the risk of running out of money before a given point in time. Are you going to cover the volatility drag on the ability to spend out of a portfolio? That drag is real. Two return streams with the same CAGR and different levels of volatility can support different levels of spending. I’m surprised to read a specific opinion in this topic. The result of a simple geometric return minus arithmetic return can only be between 0 and a +number. Ignore what volatility drag means for a moment and focus on the math, the result could be linear (like it or not negative numbers exit). Someone mentioned about diversification return (DR). 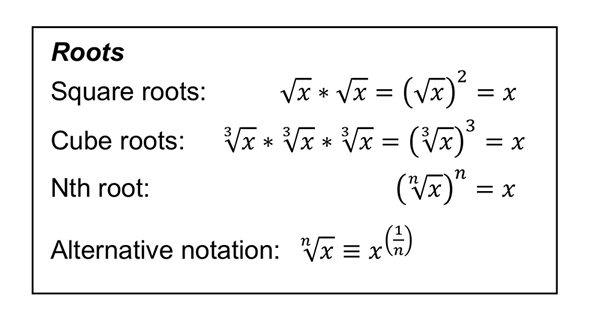 I don’t understand the reason for using variance as a substitution for return. If we applied what is stated above as the method to compute DR and treat the arithmetic computation as a benchmark, then DR is just the compounding differences between the two return calculation. I can’t wait for Part 2, but the author should be careful as there is some debate in the literature on this issue. (For example, Chambers & Zdanowicz in the “Limitations of Diversification” paper in the JPM and my article “Volatility Harvesting” in the JWM.) It is true that the expected value of the portfolio is not reduced by volatility, but the expected value is a poor descriptor of the wealth distribution, which is highly skewed. The large outcomes on the upside skew the expected value. Everyone needs to go back and read Chapter 6 “Returns for the long run” by Markowitz in Portfolio Selection (1956). Take uncertainty out of the picture: imagine an investment that oscillates between +30% and -10% return with certainty. Average return = 10%. Growth rate = 8%. Volatility reduces the growth rate, relative to an investment that gave 10% each period with certainty. When will part 2 be published? no part 2? Perhaps it got squelched.